Well hello my friends and HAPPY MONDAY! I have a confession. Those that have been reading along for with me know that the Made with HAPPY team has starting into our crazy season over here. We are busy busy bees with very busy hands creating crafts, recipes and projects for the holidays coming up as we are every year around this time. The little one and I were home alone this weekend and decided it was time to go through all our Halloween decorations and get the house ready. We pulled out a few wreaths that I absolutely love and hung them up. Which then had me thinking that we should be sharing these again with you all through social media as I love them so much and would love for you to make them. Long story short and some head scratching later, I came across two different wreaths that I’ve created over the years that somehow never made it to a post. SHOOOOOOT. Apparently my hands are working fast at creating, but not fast enough to type. In any case, I decided to work my batooty off and try and revive these sweet wreaths starting with this Halloween Coffee Filter Wreath. 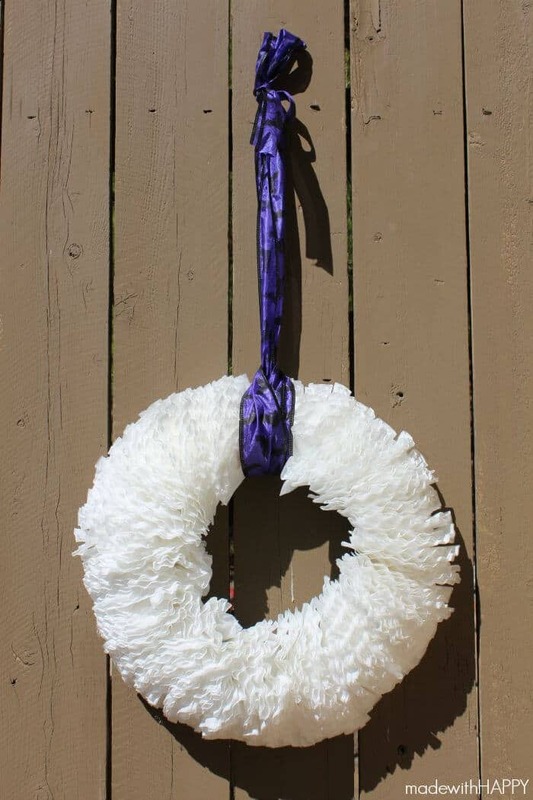 We love wreaths and this one was all the rage a few years ago. I KNOW… I’m so behind. I have no idea why this never went…. Oh well, now you have it. Here’s how you make this lovely. 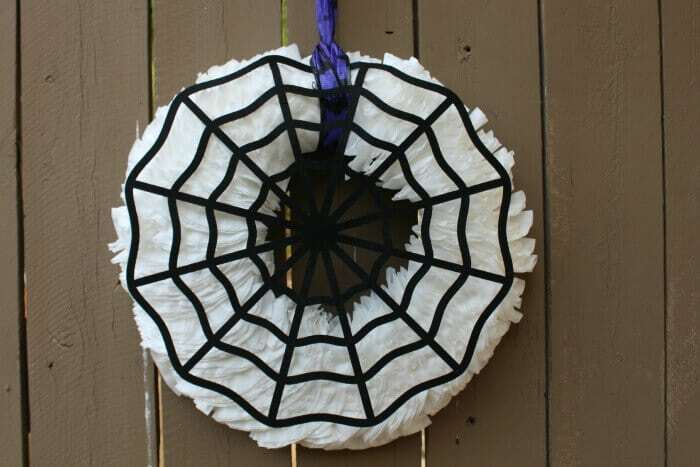 A felt spiderweb from dollar store. 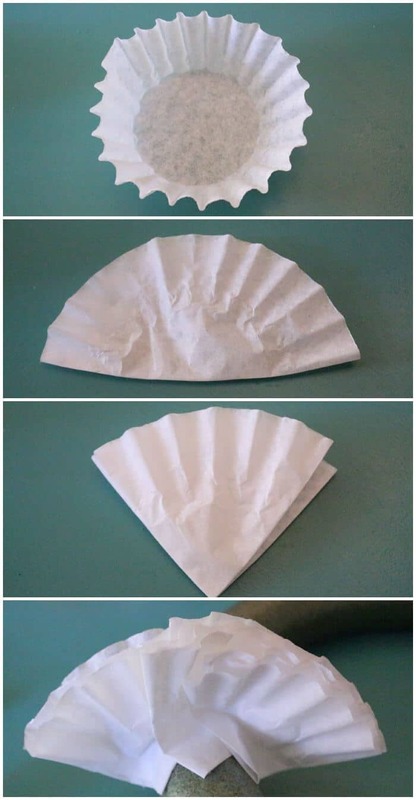 First you will fold the filter in half and then in half a second time creating a snow cone shape. Then hot glue the tips of three filters to the wreath making sure the fan side of the filters together cover 180 degrees. Add an additional row of filters on top of the tips filling the wreath in. Continue all the way around until you have a complete wreath. Add your favorite ribbon and the coffee filter wreath is done. Pretty all on its own. 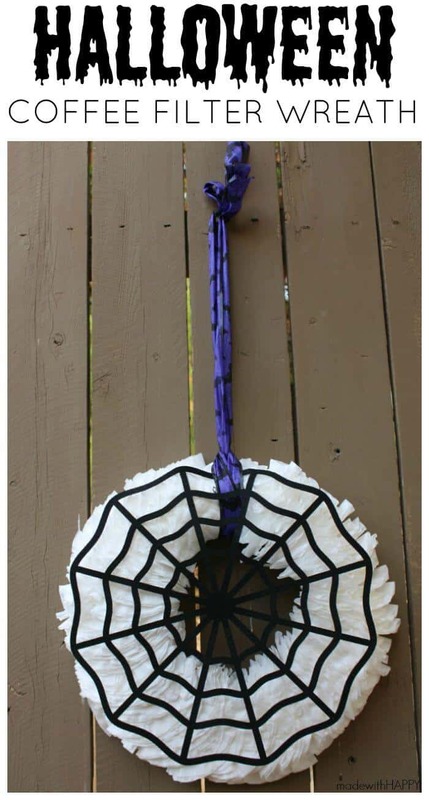 If you can find a cheap spider web from the dollar section at target or your local dollar store, then you can add it to the ribbon and viola, you have a HALLOWEEN COFFEE FILTER WREATH! I love this wreath especially on a dark colored front door. What is also great, is that once Halloween is over, you can switch out the ribbon, possibly a burlap ribbon and bow, and you have yourself a beautiful wreath for the FALL. So cute and I always have extra coffee filters!